I have a photo of myself on my phone that I have been looking at the past few days. I took the photo in early January when I was at a really low place. I had been on a gluten free diet for six months at that point. But it was what I like to call the “gluten free junk food diet.” I was still experiencing all of the symptoms of autoimmune disease on a regular basis: digestive problems, severe heartburn, insomnia, skin issues, vertigo, headaches, foggy brain, trouble concentrating, joint pain, and the list goes on. For years, I also had been trying to exercise regularly to lose a few pounds, but nothing seemed to work. Nine months later, I’m amazed at how much better I feel in so many ways. I’ve made it almost three months without a “flare” from gluten contamination, which is a small miracle by itself. But I really didn’t expect to experience so many other health improvements from my radical change in eating. Just to review, I’ve been on the Paleo Autoimmune Protocol Diet since February. (I did a month of Whole 30 in January.) What that means is I don’t eat any inflammatory foods, which include gluten, grains, refined sugar, dairy, soy, legumes, nuts, seeds, eggs, coffee, chocolate, nightshade vegetables and spices, such as tomatoes, peppers, potatoes, Paprika, chili powder and red pepper. Since about June, I have been slowly re-introducing foods so my diet is somewhere between Paleo and Paleo AIP. I now eat chocolate!! I also sometimes eat tomatoes, eggs, chili powder, almond butter and a few nuts. Once in a while, I eat corn tortillas or rice (which aren’t Paleo). However, for the majority of the time, I eat Paleo AIP because I feel my best when I stick more closely to that diet. I’ve lost 11 pounds since January. That might not sound like a lot, but on my small frame, it feels great! I’ve gone down one clothing size, and I’m at the weight that makes me feel my best. 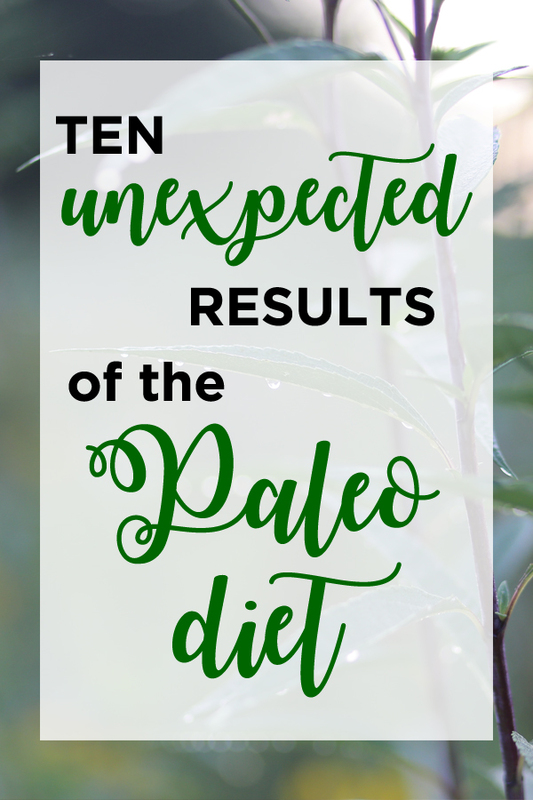 When you switch to a Paleo diet, you are pretty much guaranteed to lose weight (unless you go crazy eating a container of nuts and dried fruit everyday). I LOVE this lifestyle because I can eat as much as I want, as long as I stick to the foods allowed on the program. I eat tons of veggies, protein and healthy fat. In the past, I pretty much got through every day on a steady stream of caffeine and sugar. Now that I fuel my body with highly nutritious foods, I don’t have the extreme highs and lows or cravings for junk food. I still struggle with being hypoglycemic, so I try to eat every couple of hours to keep my blood sugar at a good level. But I’m not on a constant craving roller coaster anymore. Before I started this diet, I woke up every morning looking pretty awful. My face would be so puffy in the morning that I would try to get up an hour early if I had to be somewhere, just to give myself time to look somewhat “normal.” By eliminating inflammatory foods, I can finally get up in the morning and look like ME! I’ve had chronic vertigo for about seven years. Sometimes, I would experience at least mild dizziness for a month at a time. I’ve had a few very brief instances of vertigo this year, but it doesn’t even compare to what it was like before. Another thing that contributed to headaches and vertigo were all of the knots in my neck and back. I was a minefield of knotted-up muscles. I’m so thankful that this has changed significantly! And without all of those issues, I can sleep like a baby. I fall asleep as soon as my head hits the pillow. Unless I’m under a lot of stress, I don’t wake up until morning. In the past, it was common to be awake half the night with insomnia. Sleep is a beautiful thing! At my worst, I had extreme heartburn that even turned into an ulcer in my stomach. This is the symptom that has taken the longest to get under control. In the last few months, I have had a nice break from constant heartburn. And, of course, it goes without saying, that my digestive system is a million times better. This was the reason I decided to try the diet to begin with. The reality is that it took about six months even on a very strict diet to get my digestive system to a “normal” place. My digestive system took a beating from the destruction of Celiac Disease, so it doesn’t take much to knock me down. I know if I stray too far, with even common foods like tomatoes, spices or eggs that I won’t feel great for a few days. It doesn’t take much to mess up my digestive system, but at least now I can easily identify the trigger and get things back on track much more quickly. Today, when I pulled up that photo on my phone, it made me feel so thankful for how far I’ve come. I know that a lot of people have been praying for me and God has done an amazing work in getting me to this place. I’m also a huge believer in this way of eating, so I just wanted to share my experience in case it might help someone else who struggles with similar issues. If you want to know more about my journey, you can read about it here or listen to me talk about it on this podcast. So, what about you? Have you ever made a radical change to your diet that has made a big difference?